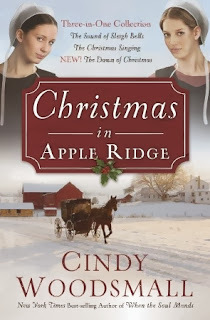 "Experience the holidays with the Plain folk of Apple Ridge, Pennsylvania, in these touching novellas centered around love, romance, heartache, and restoration from best-selling author Cindy Woodsmall. Sadie enjoys her freedom away from home and her mission trips to Peru, but after four years, her Old Order Amish family insists it’s time to come home and settle down. Levi, a bachelor who distrusts women after a family heartbreak, also has no desire for romance. To keep their families from meddling in their lives, Sadie and Levi devise a plan—but soon discover that the walls around their hearts are breaking down. Can they let go of their prejudices, learn to trust each other, and embrace a future together?" 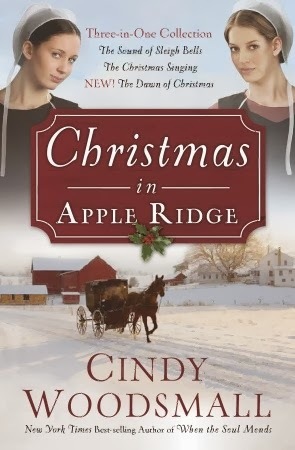 As you probably know by now, I have fallen in love with Amish romance and this book has only served to feed that love. I had already read and reviewed The Dawn of Christmas, so for me, it was all about the first two books within the book. It was a joy to read the backstories of characters that I had already met. It was like seeing an old friend, popping into a local cafe to catch up and not leaving for hours. Honestly, I have to say that Cindy Woodsmall has become one of my new favorite authors. Whenever I see one of her books in a review stack, I can't help but keep my fingers crossed that I'm going to get it. Her characters have depth and feel like people you might actually meet. I never have any problem visualizing the scenes. Honestly, there's not a single bad thing that comes to mind when it comes to her books. If you love Amish Romance or just a really good read, I cannot recommend enough that you go out and find one of her books. This one is a great one because it really is three good books all in one and not one of those skimpy books you see claiming to be. The Amish and Mennonite way of life has always fascinated me. I just started reading Beverly Lewis book - The Courtship of Nellie Fisher. It too is 3 novels in one volume - The Parting, The Forbidden and The Longing. There is an element of mystery involved regarding the death of Nellie's younger sister Suzy. There is also some unrest in the Amish community where Nellie lives as some of the Amish people are starting to question the old values especially regarding the use of tractors and such as well as the belief that if a person dies before they have made their life vows to the church that they are doomed for eternity.